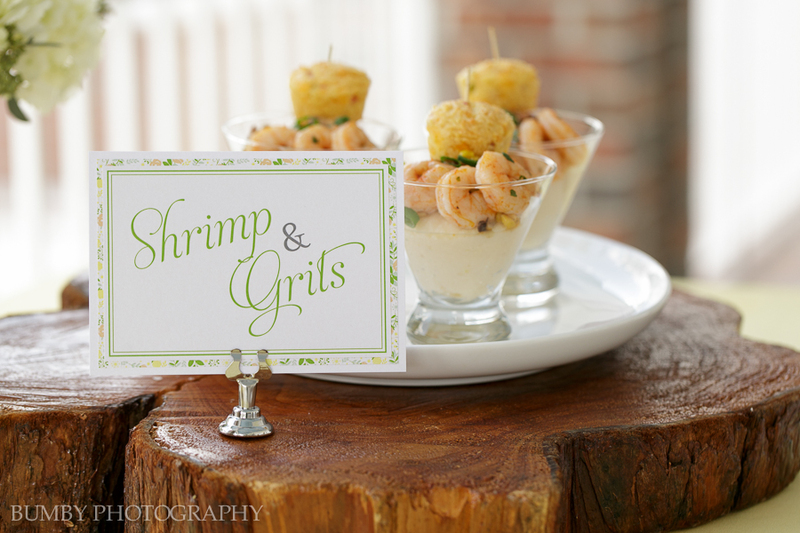 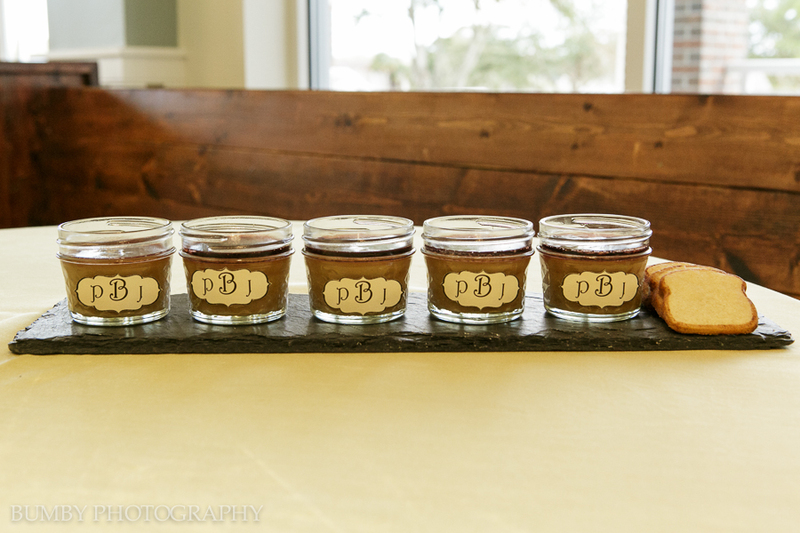 Earlier in the year, we were thrilled to be a part of a Southern glam styled shoot to promote the grand opening of the new Ocoee Lakeshore Center. 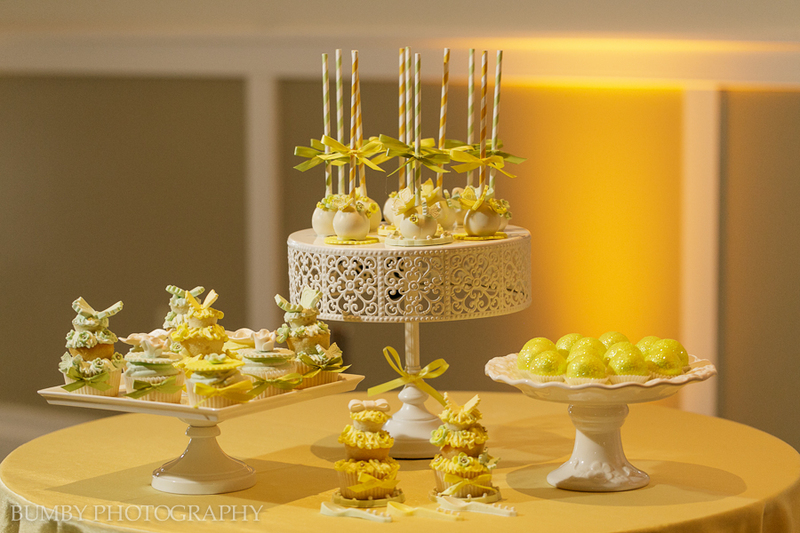 We worked alongside talented event professionals, including Bumby Photography and perfectionist planner, Anna Christine Events, showcasing Southern sophistication in the ‘Sweet as Tea, Meant to Be’ theme. 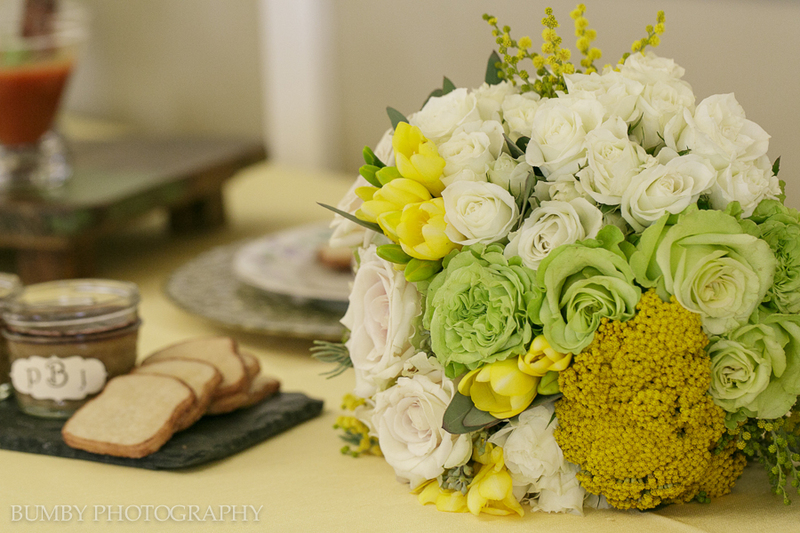 The array of soft green, buttery yellow, vibrant peach, white and gold gave the shoot a welcoming atmosphere. 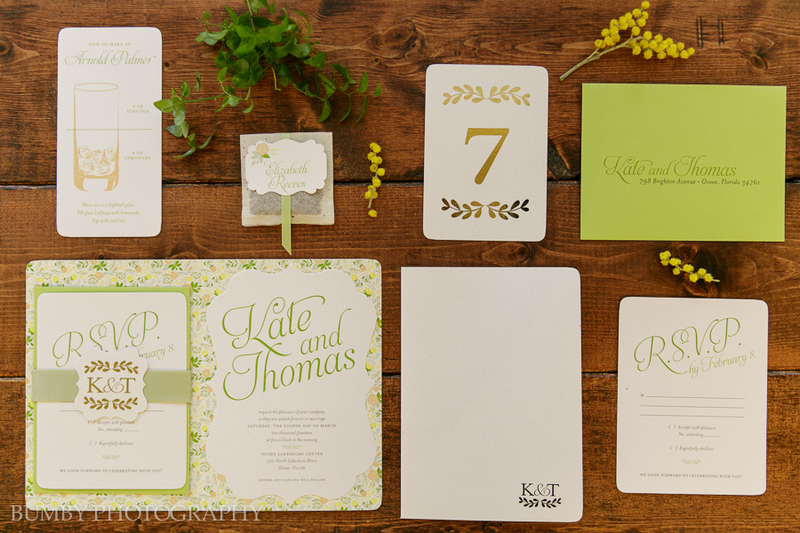 The romantic color palette flowed through our custom invitations and paper goods as we used a folding invitation with a custom, delicate vintage floral pattern on the interior, and a gold foiled monogram on the exterior. 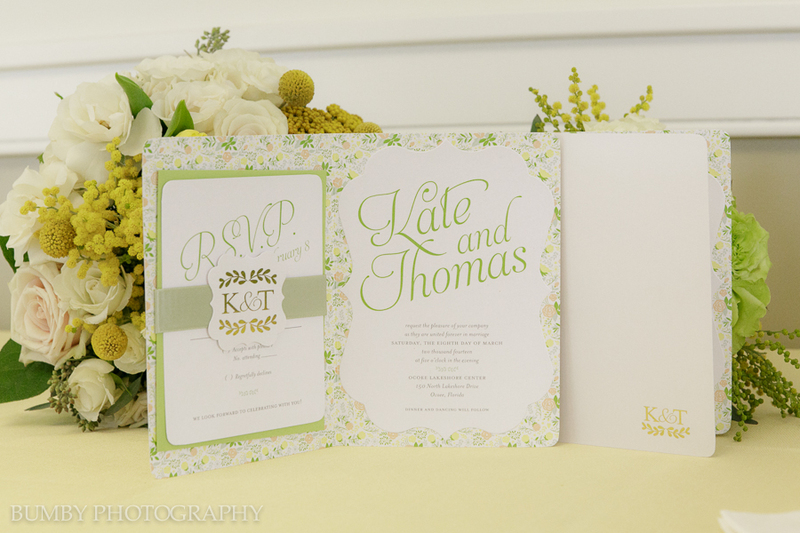 Response enclosures were contained in a moss green satin ribbon-lined enclosure band with die cut monogram. 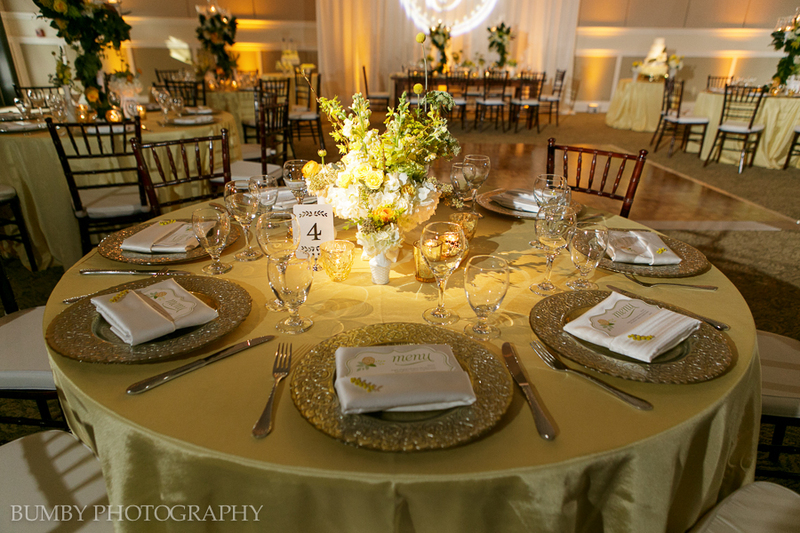 We carried the exquisite shape of the invitation over to the exclusively designed dinner menus that were nestled into a pocket of white satin on each gold charger from A Chair Affair. 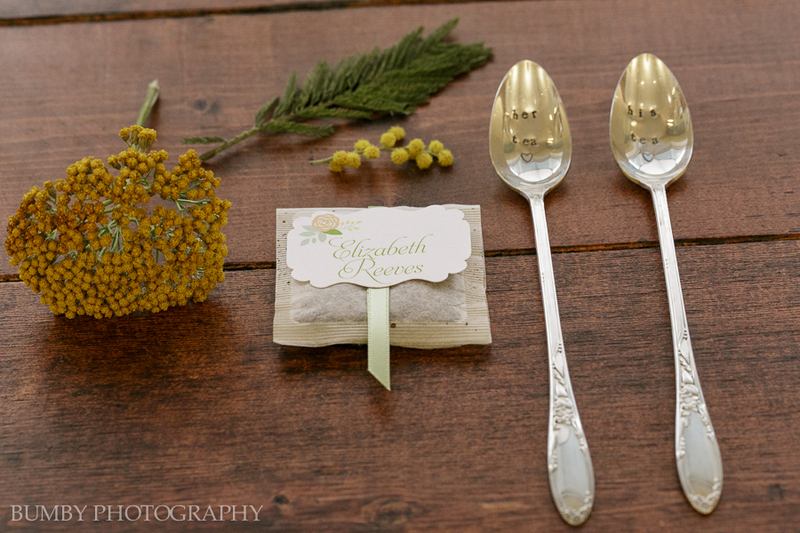 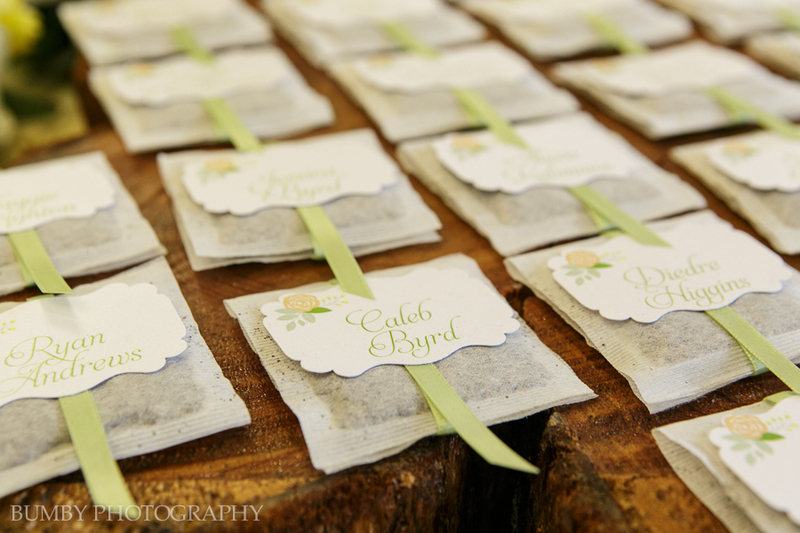 Adding a pale green border and a floral element, they matched the place cards that were attached to tea bags with complimenting ribbon. 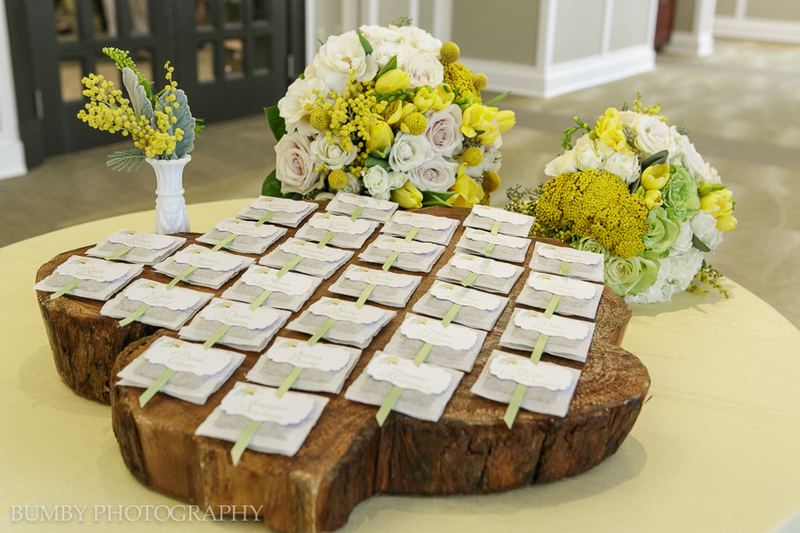 The table numbers were gold foil with a chic vine detail on white card stock. 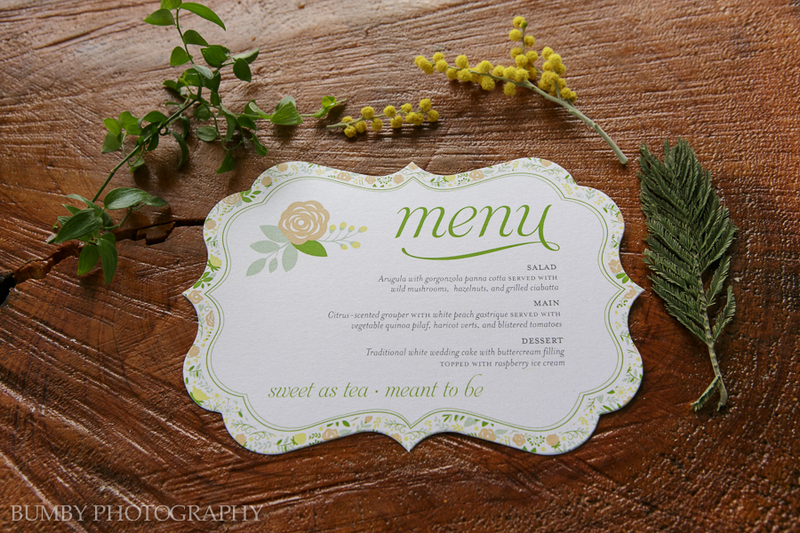 For the drink and hors d’oeuvres menus, we layered the Southern selections on top of the floral card stock carried over from the inside of the invitations, giving a lovely framed effect to the display. 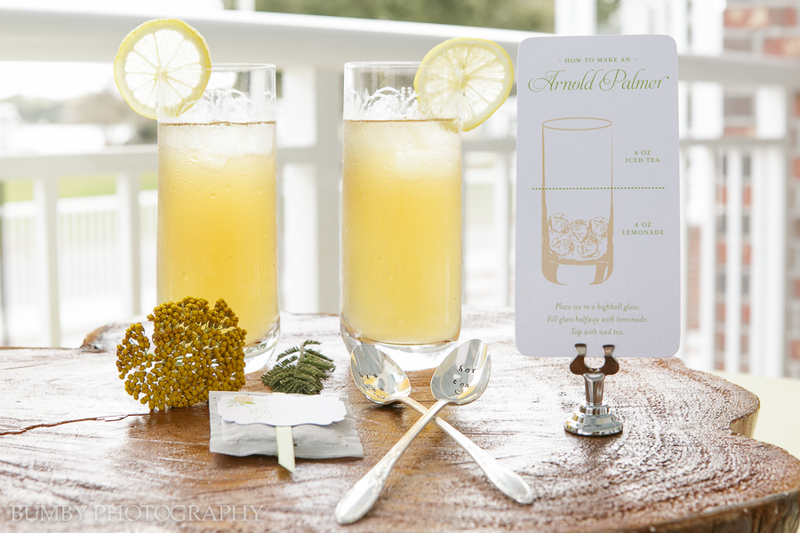 The custom made Arnold Palmer take-home bar favors detailed the recipe for the Southern cocktail. 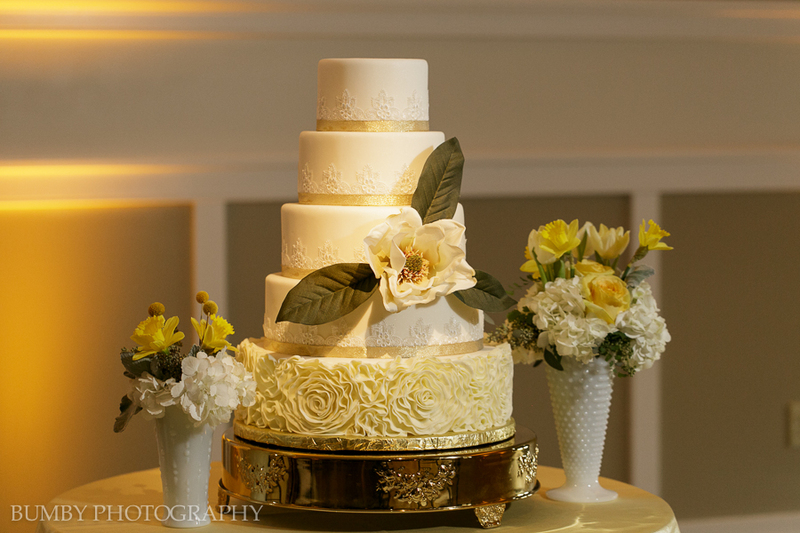 From the floral arrangements in white milk glass vases with a hand-picked feel, to the intricate detail of the five-tier wedding cake designed by Cut the Cake, to the whimsical flair of the ‘Meant to Be’ pennant-style banner, we loved the Southern elegance of this shoot! 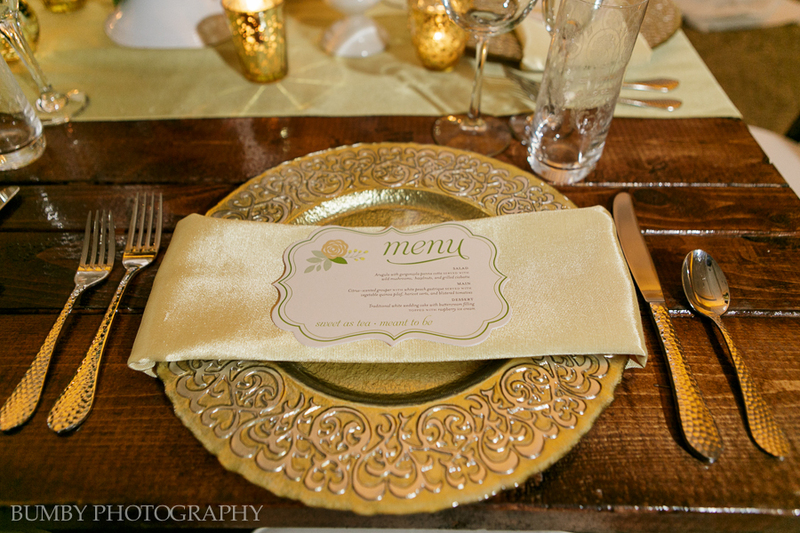 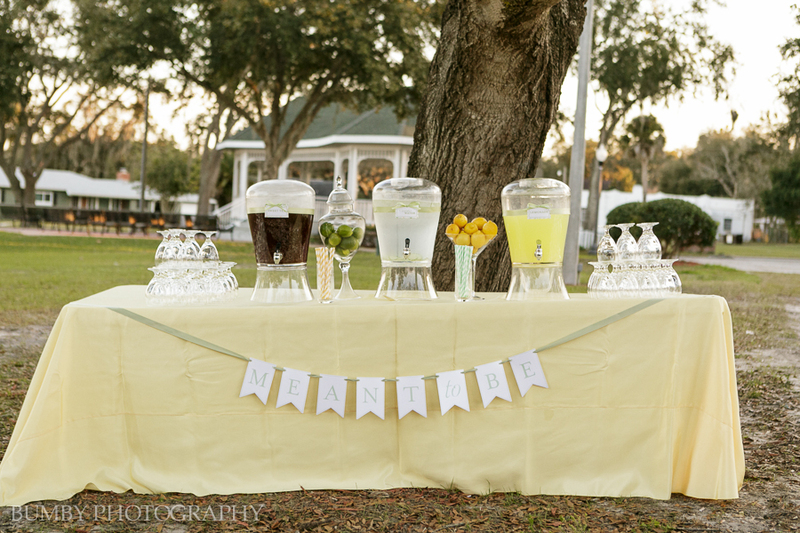 Contact us today to schedule your custom design consultation for your wedding or special event. 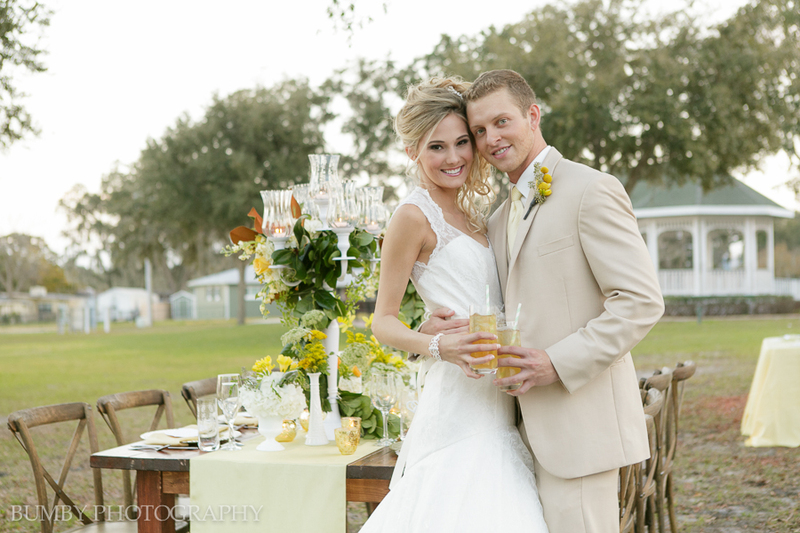 Thank you to all of the amazing vendors who made this styled shoot a success.